Every year, a Certain Someone gives me hand towels. It's what they do. Every year they come in a nice holiday box in a bed of tissue paper so they won't break. Now, I don't mind hand towels—let me go on record as saying I am an Active Proponent for Personal Hygiene, and washing one's hands is an integral part of the process. These are fairly nice quality towels, but they are always purchased with no regard for any sort of color scheme, real or imagined. So unless there's some sort of Fiestaware trend in hand towels that makes mixing weird colors Fun and Kicky I really have no place for them in my house. 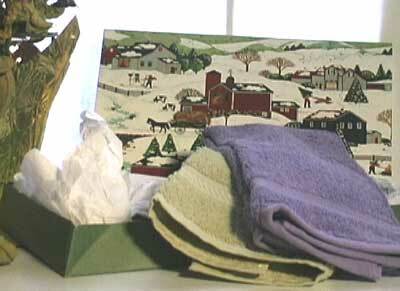 Read more about Two Pastel-Colored Hand Towels! Extra credit goes to anyone who can tell we what in heck 'n' tarnation this thing is. At first I thought it was some sort of huge tree ornament. My husband thought it was a suncatcher. Maybe it's both. It's sealed for your protection in a heavy plastic bag I have not opened. 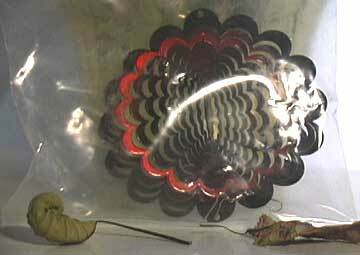 It's about 5.5 inches in diameter, sorta flower-shaped, and it's made from a surprisingly heavy gauge sheet metal. The fasteners used to hang it seem to be the sort of thing people would use for deep sea fishing lures, but since there's no treble hooks or feathers attached to it I'm guessing it's NOT a fishing lure. That would be one heckuva tuna, eating this thing. Two Men's Medium Long-Sleeved Shirts! I must confess: these did not come from this year's substantial Craptacular haul. I found them in a shirt box when I was wrapping my own paltry gifts to give to my family (oh, sure, I might be unemployed, but stint on the gifts to the family? Heaven forefend!). They were still in their box tucked among the empty shirt boxes and wrapping paper in the closet. I guess I meant to return them and just forgot. I have nothing critical to say about the shirts or their packaging, which is minimal. All I can say is there was a brief era when Certain Family Members had a brain fart regarding the size my husband wears, and bought him mediums instead of large. I meant to return them, but back in those merry days I actually had a job and I did not have the time, and evidently forgot about them. 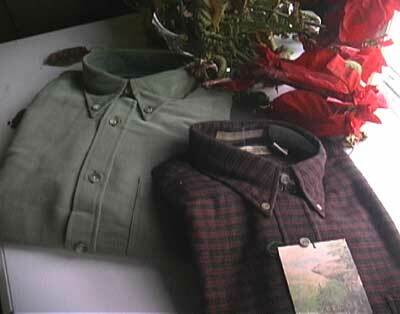 Read more about Two Men's Medium Long-Sleeved Shirts! No doubt as you made the shopping rounds this holiday season you popped into one of those Useless Yuppie Gadget stores and saw squooshy pillows for sale among the electronic golf tees and the Deluxe Executive Barbecue Utensil sets. 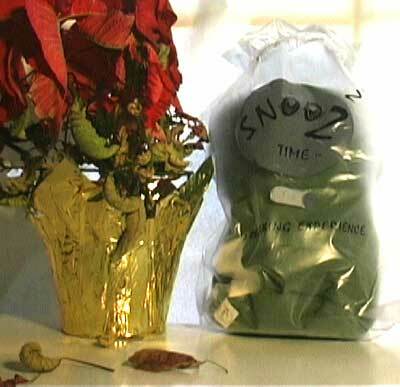 Read more about Weird Squooshy Green Pillow! "Forest Faces" tree decoration by Garden Sensations! Okay, I admit it. In better days, when I had disposable income, I once saw these in some home 'n' garden catalog, and I thought they were mildly cute. But now in my winter of unemployment, faced with the reality of actually putting this on one of the many trees around my house, I am disturbed by two possible scenarios. Read more about "Forest Faces" tree decoration by Garden Sensations! I think my brother gave this to me. I'm not sure what I'm supposed to do with it. It's a little phone-thingie with a small clock embedded in the front. If you turn on the switch on the bottom, it makes an annoying phone ringing sound when you pick up the handpiece. A three year old relative loved it. The clock pops out and I guess has a separate battery for it to work, but I can't figure out how the clock back opens to get it going. 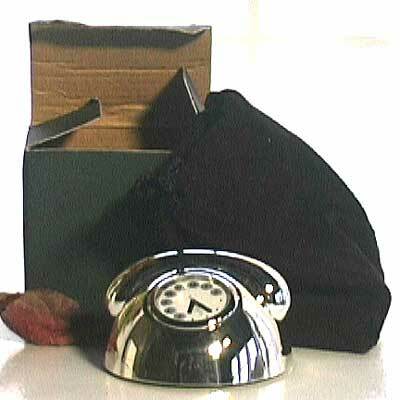 Read more about Strange Phone Timepiece Doohickey!